Today I logged onto the Cushing's Support Facebook group and heard some horrible news. 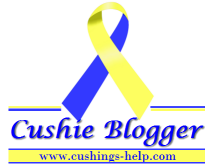 A fellow Cushie from our community had lost her battle with Cushing's. Sarah was 28 years old, and has had two pituitary surgeries to attempt to cure her of this horrendous disease. Story sounds familiar, right? She posted on Saturday in our group begging for help, her doctors weren't listening to her when she said she still felt sick and that something was wrong. Days later, she is gone. I have spent the past half hour in shock. I'm devastated for her lost life and her family's loss, I'm angry at her doctors for not listening, I'm frustrated with the medical community as a whole for not taking this FATAL disease more seriously, and I'm relieved, because it wasn't me. I feel guilty for feeling that, but it could've SO EASILY been me at this exact time last year. After my two pituitary surgeries, my illness and complications grew exponentially. I was gaining weight faster, having higher blood pressure and increasing heart problems. I had trouble getting around and doing simple things like walking up the stairs. Thankfully, it wasn't too late for me by the time I got to my surgery in September. Yes, I am dealing with another disease for my entire life that is also potentially life-threatening, but I am able to get some of my life back. I'm planning to go to school in the fall - something I never could've planned for even just a year ago. I hope to someday help people with this same disease that has taken the life of this woman too young. More has to be done. 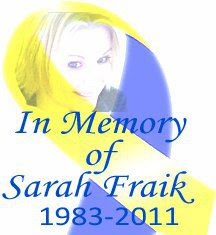 We love and miss you Sarah.